3km from city. Taxis are generally available at the pier should you wish to go farther afield. Be sure to check the condition of the vehicle and negotiate the price before setting out. English-speaking drivers are in short supply. Shuttles are in general provided for. 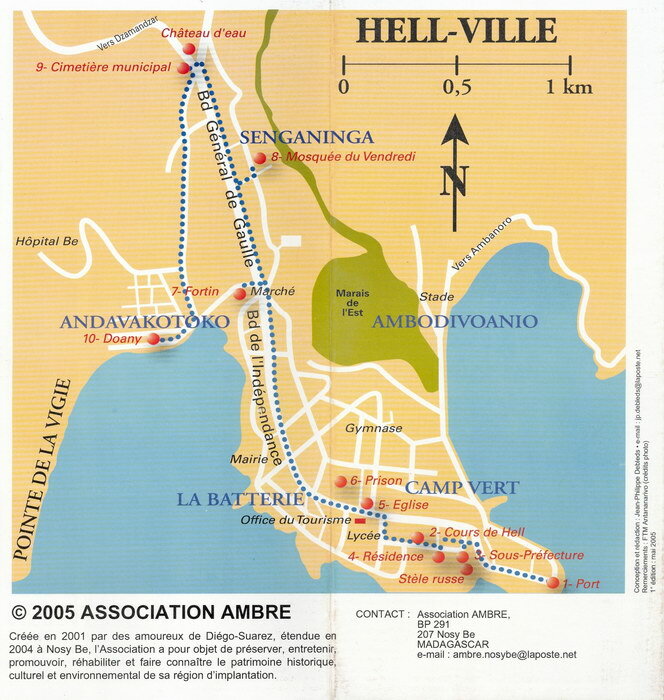 The name Hellville, is derived from the name of an early French Governor, Admiral de Hell. Nosy Be, the "Perfumed Isle." The therapeutic scents of vanilla, ylang-ylang, saffron and cinnamon will lure you in and the long stretches of beaches will implore you to stay. The largest island off Madagascar, Nosy Be is where a chosen few can be one with nature and one with the sea, in unison. Discover lush green forests and bright blue volcanic crater lakes; be serenaded by the harmonious sounds of nature; encounter mystical lemurs – indigenous to Madagascar. If there ever was an exclusive island paradise, it might just be Nosy Be. The name of the small island Nosy-Bé translates as "big island". An attribute also indebted to the beauty of its beaches and its underwater world: they are magnificent. From the port Hell-Ville you will travel to the Nature Reserve Lokobe where you will be thrilled by the Canarium madagascariense and Potameia crassifolia: giant trees up to 40 m high. Alternatively, a boat trip to Nosy Komba will amaze you: the island impresses with a huge crater cone 5 km in diameter. Nosy-Mangabe continues the series of Madagascar's great attractions with a striking 520 hectares of rain forest. But there are also small attractions: the smallest chameleon in the world lives here. With a little bit of luck, you will discover the thumb-size reptile during a hike at the end of a journey rich in experience. Palm-ringed sand beaches and quaint hotels offer lazy hours of swimming and sunning. Be aware that beaches are not very attractive during low tide. Small shops in the town center and vendors at the pier offer embroidered tablecloths, blouses, shirts and children's wear. Local perfumes, spices, wood carvings and woven straw items are also popular. The local currency is the Malagasy franc. Most shops will accept U.S. dollars. The third offical language is English, though very few people speak English. It became an offical language in 2007.